Even with the iPad eating away at the time we spend in front of the bigger screens — in my case, the iPad is my screen of choice when watching Netflixed TV shows — cable subscriptions still have a ton of appeal. Want to watch the Olympics live on your iPad via the official NBC app? You’ll need a cable subscription; and then there are all the recent great cable shows: Walking Dead, Breaking Bad, etc. But you’ll need a guide to sort through the mire, and that’s where the i.TV app and your trusty iPad or iPhone comes in. The App Store lists a heap of apps that list TV schedules, but i.TV’s beautiful interface and easy setup make it a clear winner. There simply isn’t a better-designed UI for navigating TV listings — or perhaps for navigating anything. Really, this app deeply deserves to win some sort of award for best design. But there’s more! 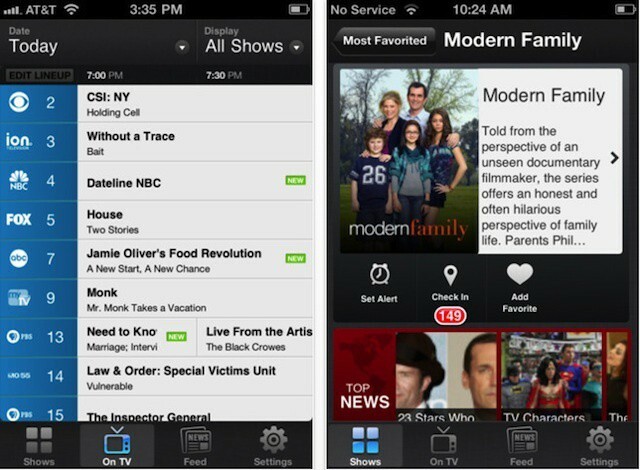 Listings are just the beginning; there’re umpteen ways to dive into TV land through the app. Of course, the app provides a tab for your own favorited shows; but there’s also a Most-Favorited tab, which shows you what other users are making their favorites. Then there’s the easy-to-read TV-related newsfeed, user-defined alerts and a bunch of other ways to explore TV. There’re even gateways that take you to the app of your choice should you want to watch the show directly on your iDevice. There’s more, so check it out for yourself — I gotta go, I’m missing my favorite show.